In Towewr Collections before 1916. Not recorded in inventory. Presumably Tower arsenal. 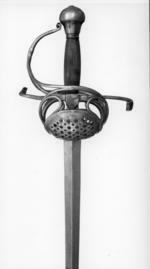 The bright steel hilt consisting of a pommel, knuckle-bow with two counter guards which connect with double ring-guards enclosing almost circular shell-guards. The last are pierced with circular and star-shaped holes.The quillons are countercurved, on the horizontal plane, and terminate in slightly splayed scrolls. The (modern) grip is of wood. The long, straight,robust blade is of flattened diamond-section and is engraved at the ricasso with the name 'PICININO' within an oval.